Synthetic biology has the potential to have a huge impact on the world, in everything from medicine to food production to energy. With this great power comes great responsibility. We explored the societal implications of our project with industry professionals and the local community. Through conferences, programs, and workshops, we remembered each and every one of the conversations we had - and used it to shape our project. We believe that the most effective scientific communication stems from effective and engaging communication. That is why, before starting our community engagement work, we dedicated time to going to workshops and reflecting on our past work to improve our own skillset. 4H Cooperative Extension is a network of over 100 public universities that provide experiences and activities for youth. The organization hosts a career explorations conference annually for high school and middle students, aiming to introduce them to the wide variety of different STEM fields. Cornell iGEM hosted a class in this program about the intersection of science and business, which is described further before. Through our participation, we were able to actively improve and consider the styles, methods, and techniques we use to communicate science. 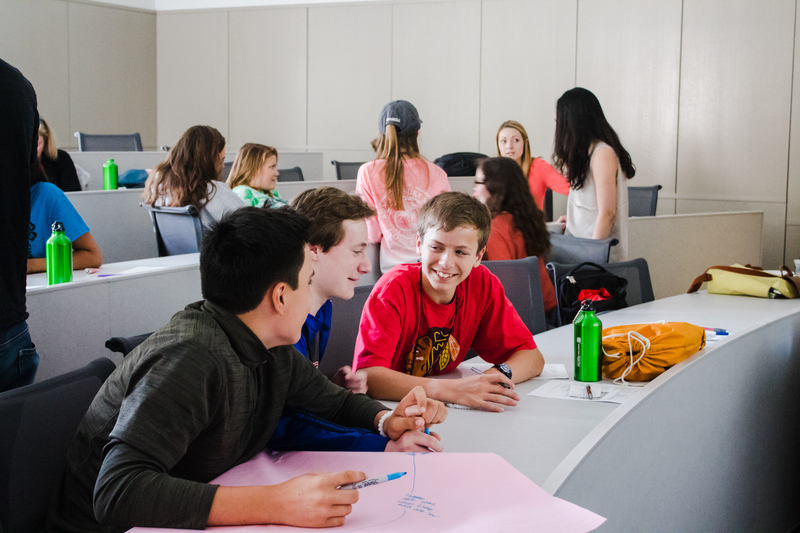 In preparation for this event, 4H partnered with the Cornell Center for Teaching Excellence to provide effective training on how to convey and teach topics interactively with a high level of engagement. Our proposed lesson plans were modeled and tested in workshops, and we learned how to develop programs that would not only capture the attention of our participants, but also lead to measurable learning outcomes. Inspired by the workshop, we decided that we should integrate Bloom’s Taxonomy into the work that we did with students. 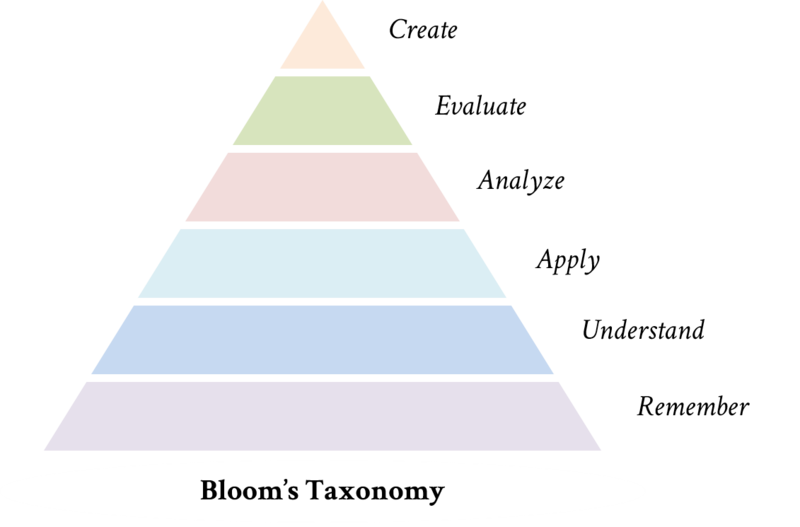 Bloom’s Taxonomy has a series of levels, seen in the diagram below. As teachers, we aimed for our participants to start at the bottom of the pyramid and work their way up. Based on the focus of every level, we developed learning objectives detailing what we would want the participants to learn and be able to do as a result. Through this we ensured the results of our programs would be measurable and significant. Throughout the rest of our outreach we critically reflected on the reactions of participants, participants’ engagement level, and participants’ grasp of new concepts. We continued to collect feedback forms. Creating the best programs requires development, and we decided to strive for continuous improvement. Every year, 4-H, a global network of organizations dedicated to youth development, sponsors a Career Explorations Conference at Cornell. The conference exposes youth to various academic fields and careers, develops their leadership skills, and gives them experience in a university setting. The theme this year was entrepreneurship. As forefronts of entrepreneurship in a synthetic biology landscape, we created a workshop bridging the gap between synthetic biology and business. Our students were 6th to 8th graders without biology experience. We taught them the basics of DNA, and delved further into plasmids and the extraction of DNA from wheat germ with a hand-on demonstration. After our lesson, we gave the students a chance to brainstorm ideas for their own plasmid - much like an entrepreneur. We asked them “what do you want your bacteria to do?” Here’s what they dreamt up. The powerpoint that we created can be found here, and the worksheet that we created can be found here. We encourage others to explore the intersection of synthetic biology and entrepreneurship, just like we did. Splash! at Cornell is an educational program annually hosted at Cornell, where students and faculty can come to “teach anything, learn anything.” Cornell students teach short classes to visiting high school students on a topic of their choosing, from immunology to salsa dance. 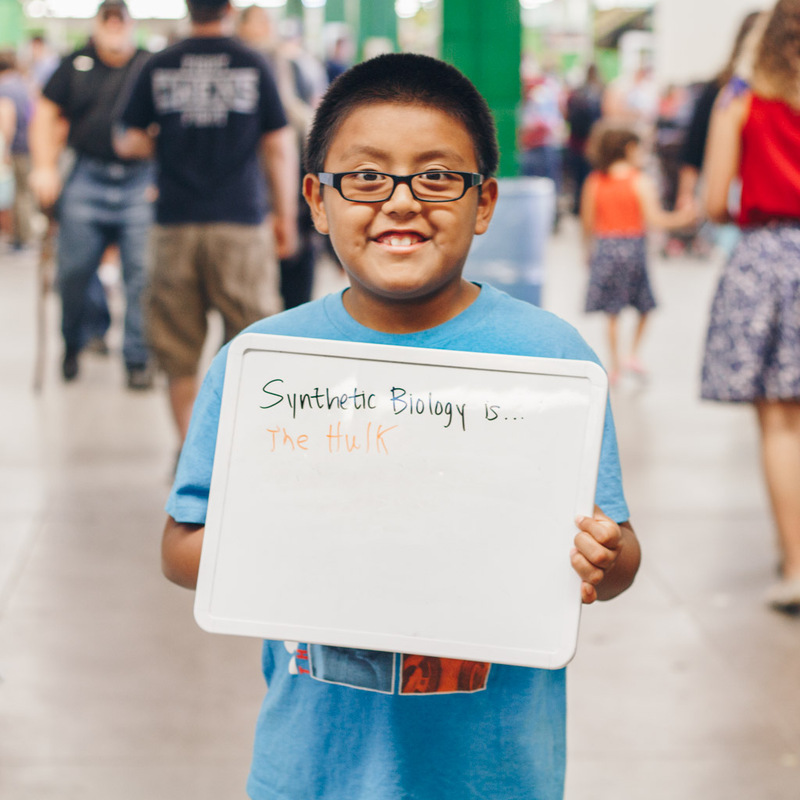 Naturally, it made sense for Cornell iGEM to teach what we are passionate about – synthetic biology! 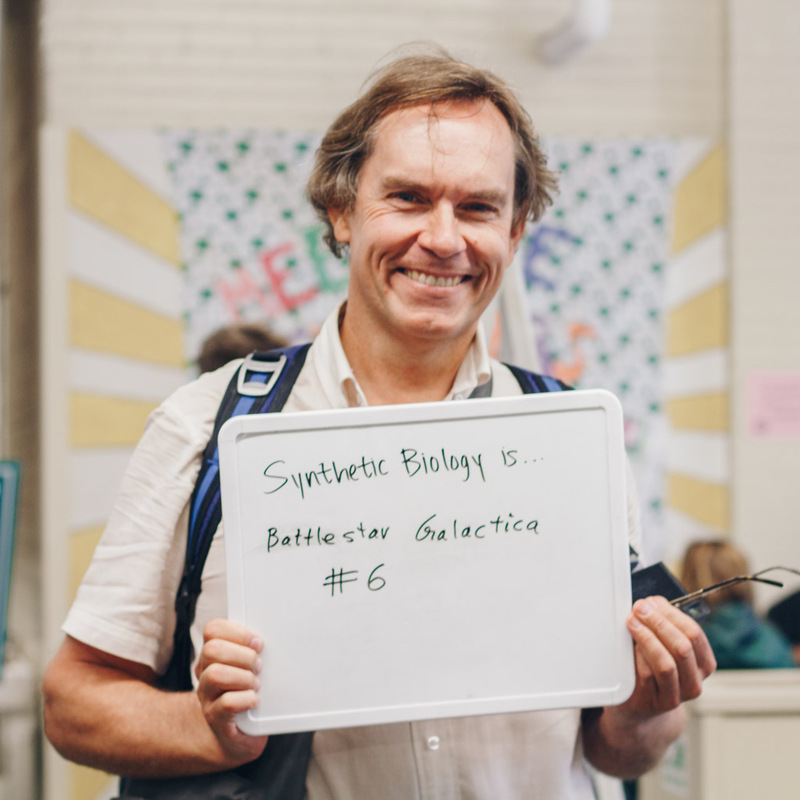 We developed a curriculum that highlighted interesting aspects of synthetic biology. We taught our students about research techniques and dove into an application by presenting our 2016 project, Legendairy. We concluded with a hands on activity - loading a gel, and a discussion of bioethical issues facing synbio using case studies. 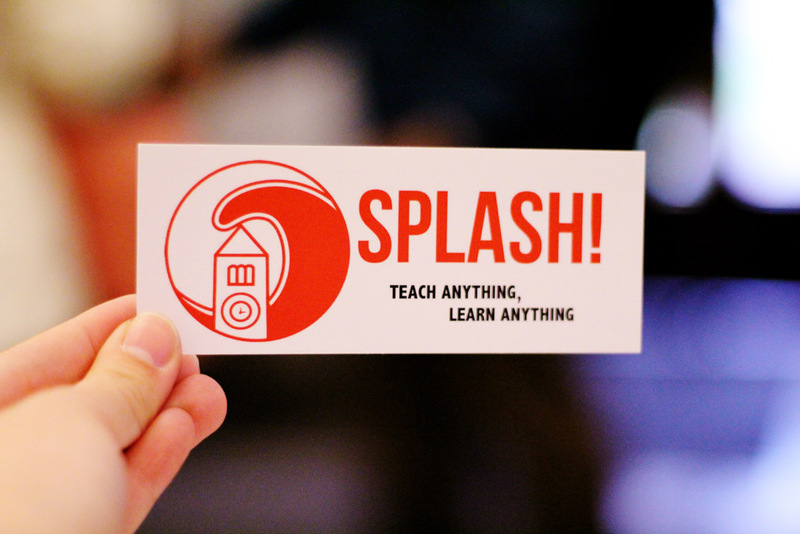 Looks like our class made a splash! We, at Cornell iGEM, know our responsibility to the Ithaca community and are more than happy to give back. As students with expansive knowledge in synthetic biology, we possess great potential to increase awareness and preparing students for this innovatively growing field. This year, we started a new mentorship program with Ithaca High School. We first launched the idea when the AP biology teacher at Ithaca High School reached out to us in June 2017. Having conducted several successful workshops with 4H extension and other organizations on campus, we pride ourselves in our unique approach and informative introduction to synthetic biology. The goal for the mentorship project is to help students who are interested in bio-engineering in IHS to build their very own synthetic biology project team. During our first visit in October 2017, we shared our past project team experiences working in a collaborative and interdisciplinary environment; we described the experience of bringing a concept to life: from ideation to development to feedback stages. In addition, we shared our brainstorming process to help lead them in the right direction to develop sound synthetic biology project ideas themselves. In the coming months, we will continue to mentor them for their upcoming Bio-Builder competition, a smaller-scale program similar to iGEM, and conduct workshops on lab techniques, teamwork and leadership. As for last week, the teacher we’ve been contacting from Ithaca High School, Ms Arti Jewett, was awarded the grant “Biotechnology in the Classroom”, which will enable us to carry out lab workshops more easily in the future. The members of our own iGEM team come from a variety of backgrounds. Some of us had excellent science programs in high school, getting involved with research and entering science competitions at the national level. However, others of us had less exposure and wanted to provide greater opportunity to the students in our community. We understand the importance of early exposure to up to date science technology in high school education. We wanted to show the students that they had the ability to take their own ideas and run with them, to innovate, and to explore in synthetic biology. The mentorship project with Ithaca High School provides them, and us too, a long-term partnership which actively enriches our community. An American tradition of over 175 years. An annual attendance of over a million visitors. 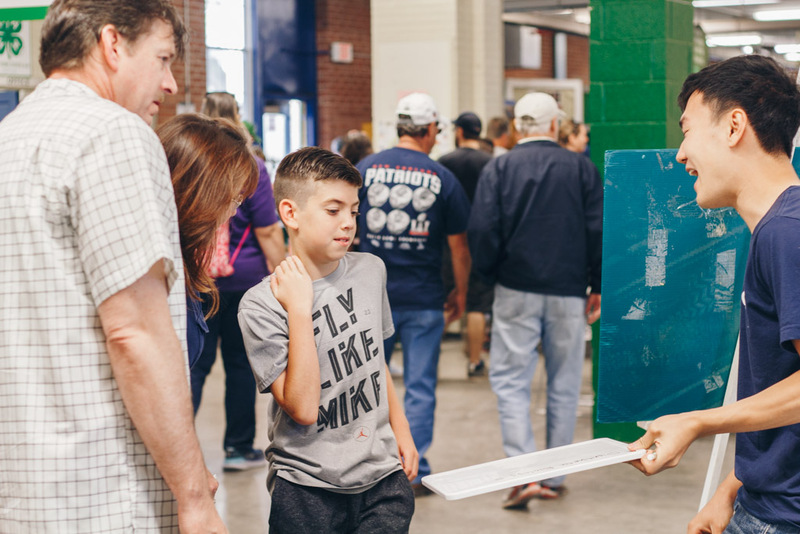 These factors made the Great New York State Fair, a thirteen day celebration of New York’s agriculture, entertainment, and technology, the perfect place for Cornell iGEM to reach out to a large and receptive audience. Our aim was to bolster the fun and festivity by exhibiting our hydroponics synthetic biology application, and discussing the myriad of opinions surrounding genetic engineering. 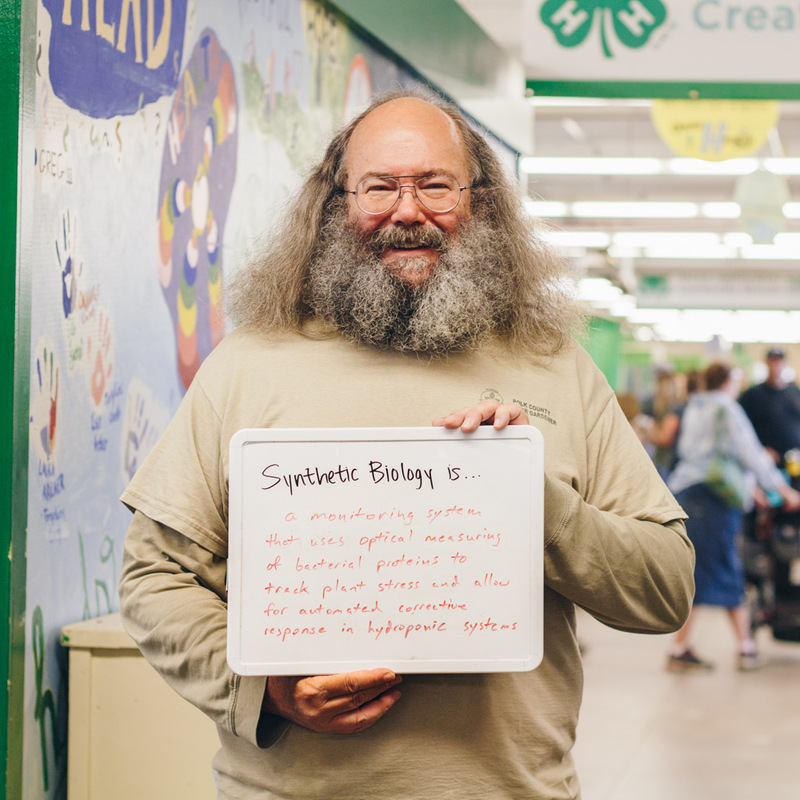 We encountered many families who had no idea what "synthetic biology" meant. But by discussing and engaging their curiosity with activities from Building with Biology which illustrated synthetic biology as a way to put different pieces together to solve a problem, we were able to describe the essence of synthetic biology. 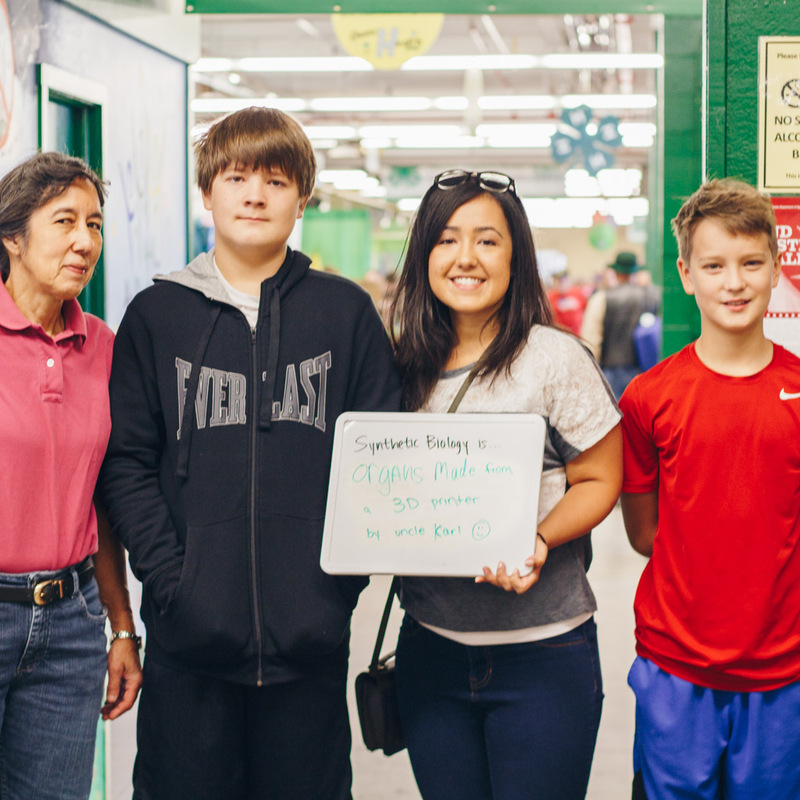 Afterwards we asked them to participate in our photo campaign, called Humans of SynBio. It was not always a consensus. During some of our conversations, we had fairgoers who were convinced that genetic engineering is dangerous for human health. Rather than immediately refute them, we listened and facilitated dialogue to resolve misconceptions and hear these various viewpoints. Ultimately, our goal was to engage in discussion with all that came to our booth, who were curious, uncertain, or apprehensive of the prospects of synthetic biology. By the time we left, we had achieved that (We also managed to eat a ton of fried dough!). After visiting the state fair, we reached out to a student organization at Cornell, Debate in Science and Health, and joined in on their public forum on gene editing. 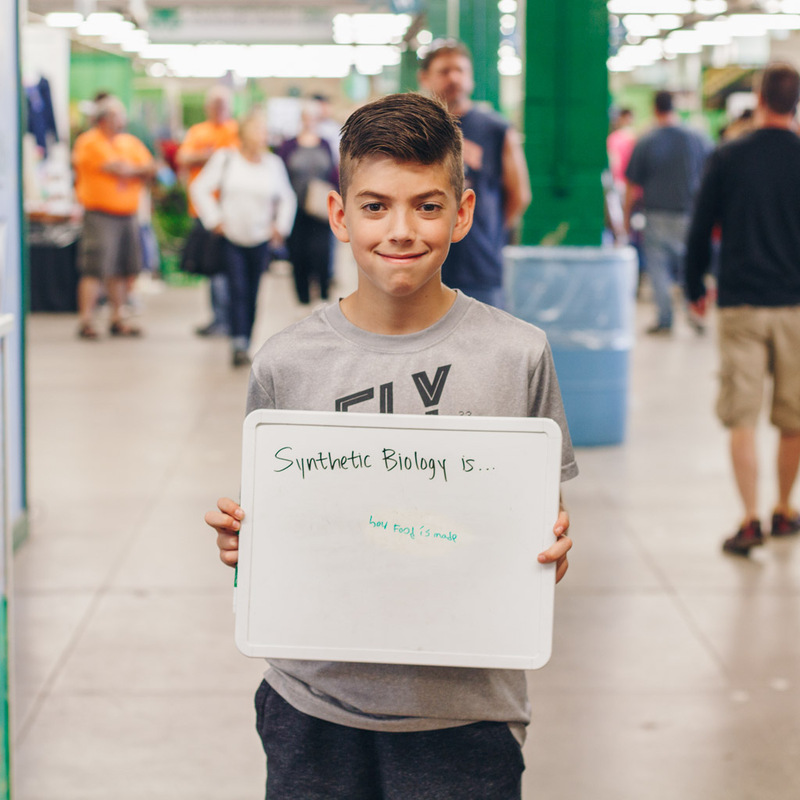 Using what we learned at the state fair about people’s misconceptions and apprehension about synthetic biology, we helped catalyze important discussion on our own campus about current and future technology for genetic engineering and synthetic biology. For analysis and discussion of the results, see the Collaborations page for more information. RAWExpo is an annual event at Cornell meant to showcase the work of creators in all disciplines. iGEM attended and shared our work engineering life through synthetic biology. At our display we showcased last year’s project and discussed our ideas for this year’s project. The dialogue among other groups of creators in the Cornell community, ranging from engineers building planes to design students creating fashion lines to architecture students designing structures, was beneficial for our team, and helped us more thoroughly consider the users of our project and the aesthetics of the final deliverables of our work. Makerfaire is a symposium where different groups display the innovative ideas and creations they have come up with, often applying the principles of engineering. Among airplanes, cars, and model architectural structures, we showed others how to create with biological tools. 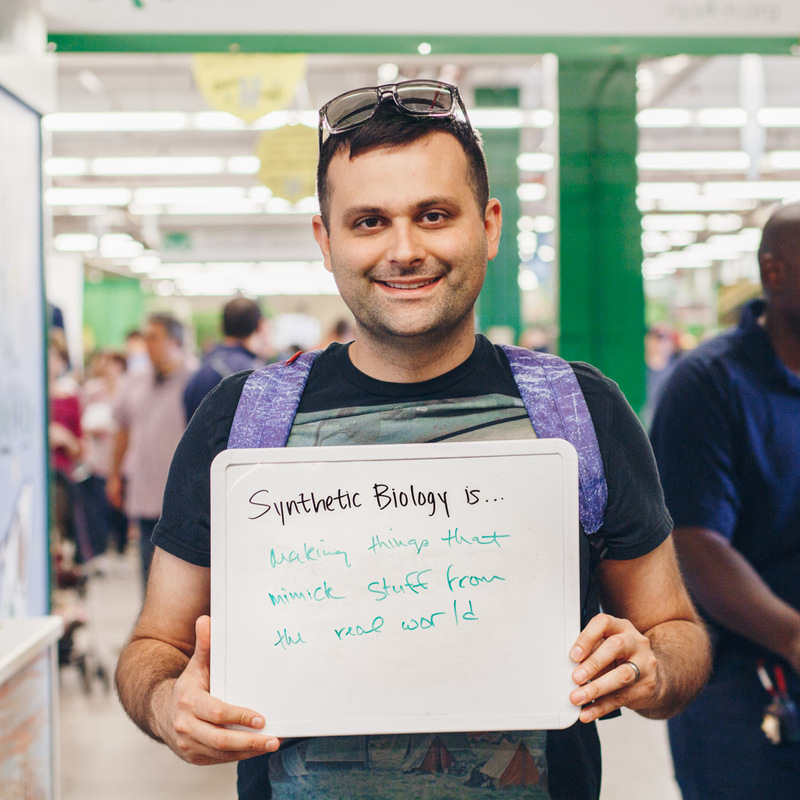 We talked to visitors about the possibilities that synthetic biology could bring to reality. We discussed the types of techniques that could be used, such as cloning and CRISPR-Cas9, and also explained our past and present projects as tangible examples of what synthetic biology could accomplish. 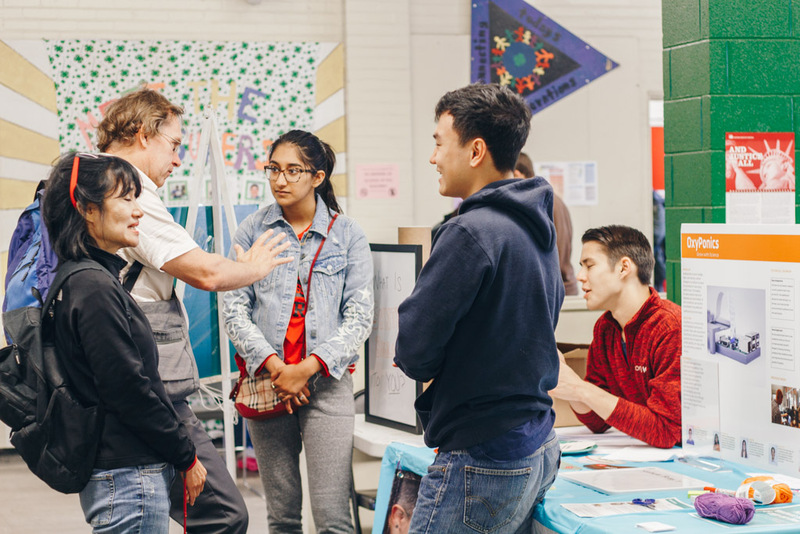 Makerfaire was a wonderful place to showcase synthetic biology’s ability to push boundaries and its increasing role in the society, both of which iGEM encompasses. Despite huge progress over the past decades, women still struggle to advance in several fields of engineering. The Cornell Society of Women Engineers organized a way for high school women to connect with Cornell engineering students. As a team with driven women pursuing STEM careers, we participated in the event. Our involvement was two-fold. First, we attended a tabling event where girls could chat with us about our experiences in biological, chemical, and computer engineering - all of which are components of the work that we completed through our iGEM projects. We also spoke to them about our past projects. Second, we hosted a lab tour for students who showed specific interest in biological or biomedical engineering. During this portion, we went into detail about our project timeline, the biological principles behind this year’s project OxyPonics, the uses of all of the laboratory equipment, and what made us want to enter engineering. Our team also has the unique culture of being very student driven, which has let us explore what interests us most in the problems we tackle and engineering solutions we develop. The young women who visited us said they felt inspired to pursue biological engineering. They were determined to break boundaries in the different fields of engineering. 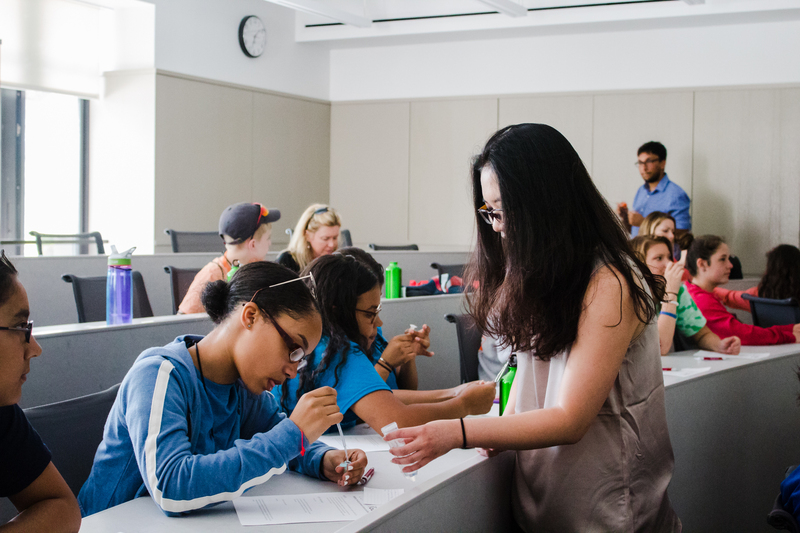 Every year, Cornell Office of Undergraduate Biology hosts a science outreach program for the incoming freshmen on campus who are part of the Prefreshman Summer Program (PSP). A variety of engineering project teams, such as iGEM, and undergraduate scientists give lab tours and participate in a panel discussion where the incoming freshmen can learn what it is like to work in a lab and how to get involved in science on campus. We showed freshmen around our lab, including specific equipment and their purposes, talked them through what iGEM is and what our past and present projects are, and answered any questions they had about how to get involved in science at Cornell. Many of the pre-freshmen showed great interest in joining a project team or doing research on campus. Every summer the Office of Undergraduate Biology at Cornell University runs summer events as part of a program called the Summer Institute of Life Sciences. At the end of the summer, there is a culmination symposium. This year our team chose to give a 10-minute presentation at the seventh annual SILS symposium. This opportunity to share our work on OxyPonics with the Cornell community and visiting summer student researchers also gave us a chance to get valuable feedback from professors during the question and answer session. We also were able to learn about some really cool research other students were working on! ENGRG 1050 is a course that all freshman engineers at Cornell are required to take. It is an opportunity to get adjusted to campus, to meet fellow students who are in similar majors, to ask upperclassmen questions, and to learn about applications to project teams such as iGEM. We presented about what we do, on how to join iGEM on campus, and answered questions from the freshmen.